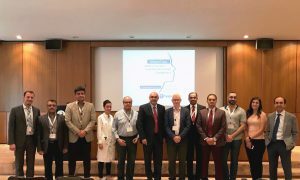 Eight oncologists from the Middle East visited HYGEIA Hospital on July 10 and 11, 2017, at the initiative of the Hellenic Society of Head and Neck Oncology (HeSHNO), in partnership with the Institute of Cancer Research (ICR) in the UK. The visit included lectures and discussions on head and neck cancer that focused on the latest developments. The HYGEIA Hospital Radiotherapy and Oncology Center also presented interesting cases and their treatment planning. Mr Christos Georgalas, ENT Specialist, Associate Director of the HYGEIA Hospital Head & Neck Clinic and Director of the HYGEIA Hospital Endoscopic Paranasal Sinus & Skull Base Surgery Department. Mr Konstantinos Dardoufas, Radiation Oncologist and Director of the HYGEIA Hospital Radiotherapy and Oncology Center. Mr Dimitrios Moraitis, Head & Neck Surgeon and HYGEIA Hospital associate. Mr Konstantinos Papakonstantinou, Plastic Surgeon and MITERA Hospital scientific associate. Mr Konstantinos Papakostas, ENT Specialist and Director of the MITERA Hospital ENT Clinic. Ms Konstantia Tsamasioti, Radiation Oncologist and associate at the HYGEIA Hospital Radiotherapy and Oncology Center. The guest oncologists showed great interest in the lectures as well as their tour of the Hospital facilities. They were given the chance to get updated on the latest developments, but also discuss their concerns over complex oncologic cases and get acquainted with the latest state-of-the-art equipment installed at the HYGEIA Hospital Radiotherapy and Oncology Center.